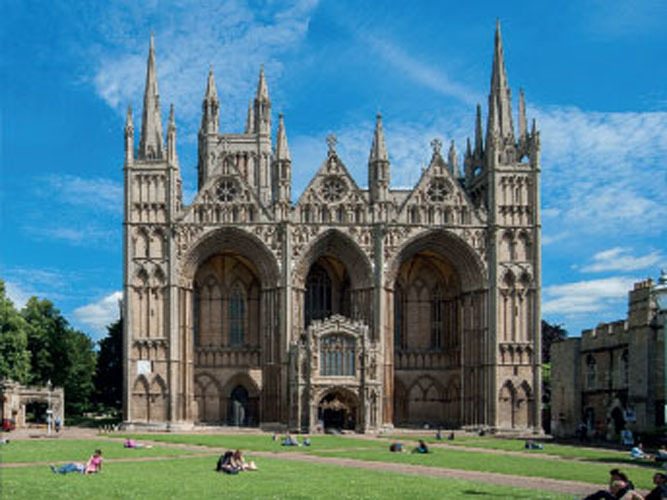 This tour, which will start at 11am, will take in Peterborough Cathedral and its precincts, including a wing designed by Edwin Lutyens. The service wing of the much-altered 11th/12th-century Bishop’s Palace at Peterborough was added in 1897 by Bishop Edward Carr Glyn (1843-1928). In April 1897, Lutyens met the bishop to discuss the project. Even then, after hearing a comment that he would design a “cottagey” building, he feared being ousted by another architect but was heartened by Lady Emily’s stalwart support: she urged him to win “by being absolutely businesslike and practical”. He completed the plans by June. The Cathedral’s logbook records the new wing “containing seven rooms on the ground floor, menservants’ bedrooms, lamp room, dairy etc, and seven servants’ bedrooms on the first floor. The paddock adjoining… was taken into the garden and planted with fruit trees and other special and ordinary trees”. There is no evidence that Gertrude Jekyll was involved. The plans were submitted to the Council on 5 August, 1897 and approved on 17 September. There are Roman remains on the site of the Minster Precincts at Peterborough and Bede’s History of the English Church records Saxulf, made Bishop of Mercia in c674, as the constructor of the first monastery. During the 13th century the church was doubled in size and became an abbey and by 1539 a Benedictine monastery developed around it. This layout is still reflected in the plan of the Precincts today. Extensive grounds were laid out around the Lodgings (later the Bishop’s Palace) and the great Norman Gate was created. Following the Dissolution of the Monasteries, the new Diocesan order came into being, the Bishop took over the Lodgings and the Dean was installed in the Prior’s Lodgings. The remaining monastic buildings became six Prebendal Houses, thus securing the occupation of both the buildings and their gardens. During the 20th century, the layout of some of the garden has been simplified but the general pattern and structure of the landscape retain their medieval origins, overlain by a Victorian character. If members wish, they can stay on for evensong that evening at 5.30pm. The Dean, the Very Revd Charles Taylor, would be available to welcome the group in person. Tickets cost £10 (to include a £5 Gift Aid donation). Please send a stamped addressed envelope — or your email address — and a cheque for £10, made payable to The Lutyens Trust, to Paul Waite, 20 Ingelow House, Holland Street, London W8 4NF. For more information, email Paul at pjdwaite@hotmail.com.